Loofahs are a beauty tool popularly used in the United States to exfoliate the skin. Loofah sponges (sometimes spelled luffa) are created from the coarse inner fibers of the fruit of the plant Luffa aegyptiaca. The fruit is a gourd, and the plant is commonly called the luffa sponge gourd plant. In other countries, the fibers from the luffa plant are also used in household cleaning tools, according to the North Carolina Department of Horticultural Science. 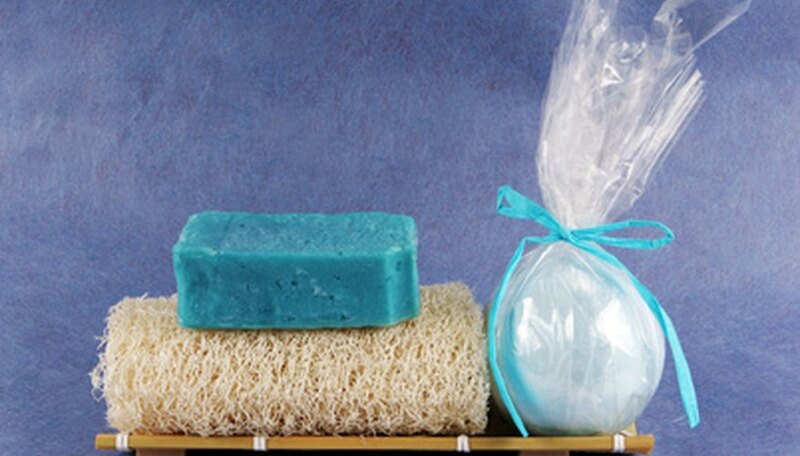 Loofah should be washed on a regular basis, otherwise soap scum will build up in the loofah. To wash it, rinse it well with cool water. Fill a bowl with a liter of water. Add 2 tbsp. vinegar to the water and set the loofah to soak in the liquid. Leave it there for two hours, then pull it out. Let the excess water drip from it until it stops, then place it on a clean surface to dry. Newly purchased loofahs are very hard. When added to warm water, they should become soft. If the loofah is still to coarse for your preferences, you can soften it by soaking the sponge in a solution of water and bleach. Use a ratio of 1 gallon of water to 1/2 cup bleach. Test the loofah often for desired softness. If you leave it too long in the bleach, the fibers may become overly loose and ineffective for exfoliating. Keep your loofah as dry as possible when you are not using it. Do not store it in a location where it will be wet for long periods of time or even in an area that has high humidity such as the bathroom. If the loofah stays continually wet, it may develop fungi such as mold and mildew. You may be tempted to sterilize your loofah in order to ensure cleanliness but resist the urge to immerse your loofah in boiling water in order to kill germs that you think may be lurking in the sponge. Boiling water may cause the fabric or wooden handle from separating from the fibers or backing, ruining the loofah. Loofahs should be thrown out and replaced at least once a month. Even if you clean it faithfully, these sponges are still a breeding ground for bacteria. Replace it even more frequently if the fibers become too soft to effectively exfoliate.